A Tube Recharge system collects run-off water and allows it to infiltrate into the aquifers using the aquifer as a storage. The water level in the aquifer increases preventing wells to dry up towards the end of the dry season. This helps to prepare the communities for the effects of the climate change. 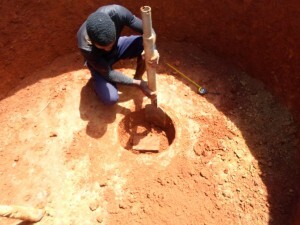 The SMART Centre offers training to companies in the construction of this low-cost technology. More information on the technology can be found on Akvopedia.